Whether you are planning your little boy’s birthday or a corporate event with hundreds of people, we can help coordinate your entertainment and party planning needs. Cotton Candy, Snow Cone and Moon Bounce rentals can make your little one the happiest in the neighborhood. Upon delivery you can expect to informed of the safety rules and procedures, how to operate equipment including a demonstration of how to make cotton candy and snow cones. Our parties are sure to bring the neighbor kids around begging for a chance to play on the inflatable castles and slides. Yes, we even arrange evening parties for the grown-ups, including overnight rentals. Keep us in mind when considering your next birthday party or fundraiser event. As you probably well know, we have been growing every year and providing outstanding service to all of our clients. We have some more great news. We are about to add several more items to inventory this season. With any luck you should start seeing these new rental items appearing on the website around mid May. 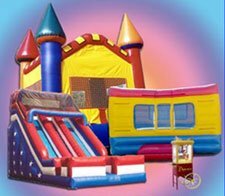 The items we are hoping to acquire include: Many Bounce Houses (some themed), Combo Unit, Joust Arena, Boxing Arena, Sumo Suits, additional generators, and a couple more slides. Another Dunk tank is also in the works, probably will not be available until June or July. Also we have located a nice GYRO Sphere. We have not made an offer yet, but we could be looking into adding that to inventory as well in June. Fingers are crossed. Spring has been very nice to us this year. Many of you have made rentals for your future events, and we had a record breaking March. With the weather being so nice, parties have been in full force, we are pleased that we have the opportunity to help you make your events such a success. Keep Affordable Inflatables in mind for all of your events. Kansas City Rentals, Cotton Candy Rentals, Snow Cone Rentals, Moon bounce house inflatables, inflatable castles, water slides, dry slides, double slides, inflatable slides, inflatable water slides, party rentals, party planning, birthday rentals, party supplies, party equipment, moon bounce rentals, obstacle course rental, inflatable obstacle course, bounce castle, party jumper, inflatable jumper, bounce house, moonwalk, moonwalk rentals, jumper rental, moonwalk jumper, bouncey house, bounce jumper rental, party bounce, party castle, party jumper rental. YOU CAN ENTER THE DISCOUNT CODE ON THE "EVENT INFO" PAGE. FILL IN THE CUSTOMER INFO REQUIRED TO PROCEED TO "EVENT INFO".